Hi everyone I'm sharing a new card using some great stamps available from the store to create my card. 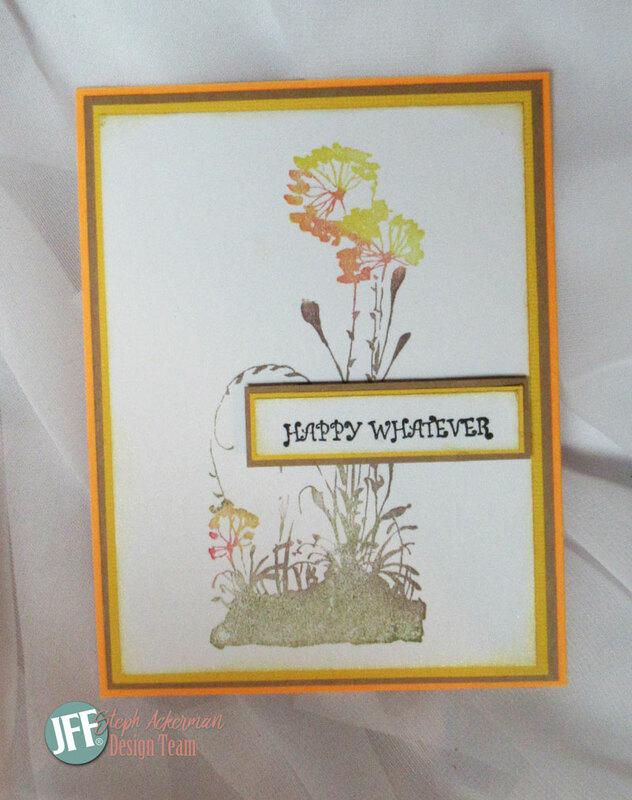 Some times, you need a "happy whatever" card to send someone showing them how much you care! Using the Brushed Wildflowers stamp, I inked it with several colors of ink, then lightly spritzed the stamp with water as I wanted a water colored effect. Stamping the image on cardstock, I had a fun effect. This stamp was perfect for this technique. I then matted the panel on 3 layers of cardstock sto emphasize the colors in the image. Happy Whatever from the Sentiments 1 stamp set, was stamped in black ink and matted with 2 layers of cardstock before being added across the stamped image. You had me at watercolor! Love the neutral colors and the any occasion sentiment!